From the personal collection of Jimmy Ellis’ / Steve Kelley. 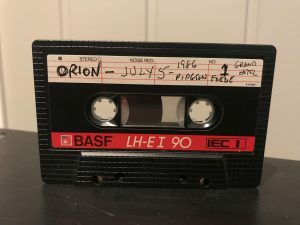 This is the master tape from the second show of the showcases Jimmy did at Pigeon Forge on July 5, 1986. The sound is perfect as you can hear. This is the cassette that was used on the long sold out CD we released called “Jimmy Ellis – live at Pigeon Forge 1986” – only this is the unedited cassette. To make it fit on the CD we had to remove the introduction of Orion and a lot of talk in between songs etc. On this tape it is COMPLETE and the one Orion got in his hands after the shows.